I’ve been a little stressed out lately which leads me to rearrange furniture (hence my beloved albeit work in progress new ambivalently aqua office) and bake. The baking serves a dual purpose as consuming sugar is another of my favorite coping mechanisms. One night after dinner we had a simultaneous craving for something, anything really, sweet. But we were broke. See previous post for explanation. Upon looking in the relatively barren cupboards this is what I came up with, inspired by a spicy cookie conversation had earlier in the week: chocolate, cayenne, and salt. I found a disc of Tazo’s chipotle chocolate that had been hiding behind a tin of tea and we were setter than set. He counted out some quarters from a coffee mug on the kitchen counter and ran to the store for chocolate chips because I insisted it just wouldn’t be the same without lots of chocolate chips, the one meager disc of chocolate would not suffice. Our precious quarters were worth it. And it wouldn’t have been the same, I was right. The chips were critical. I meant for him to grab dark chocolate chips, but he got the regular ones. Being a dude and all he wasn’t paying attention to the finer points (percentages, obviously…or the word “dark”) of chocolate chips. The bag said “chips” and that was good enough for him. That said, I actually really liked them with regular old chips. There’s a lot going on in these cookies and they aren’t cloyingly sweet so I didn’t mind the regular in this situation as opposed to my default of dark chocolate in everything. I regard milk chocolate, as a general rule anyway, as largely inadequate and inferior on the whole to dark. But I think if I made these again I’d do it the same. So. A quick run to the wizard (a.k.a. Google), and I turned up this recipe from The Gouda Life. A little bit of tweaking to make them saltier and spicier plus the addition of chunks of chipotle laced mexican chocolate, and I think I may have found my favorite cookie. Given I’m fickle and find new cookie paramours on the reg, but for right now these are in all honesty the love of my cookie life. They’re almost like cookie brownies if you get the baking time juuust right. A little over and they, as most cookies do, become crunchier upon cooling while still a little chewy in the middle. I’d say bake 15 minutes for golf ball sized cookies, 16 if they’ve been chilled, but it all depends on cookie size and oven in the end. Test to find the sweet spot if you can because when you find it they are perfectly crisp outside and yield to a tender chewy brownie-esque interior. Whisk the first six ingredients together in a bowl. In a stand mixer fitted with the paddle attachment cream butter until pale and fluffy. Scraping down bowl as needed, beat in sugars until smooth and fluffy again. On low add in vanilla and one egg at a time, scraping as needed, until incorporated. Add in half the flour mixture on low and mix to incorporate before adding the other half. Mix until just incorporated and then stir in the chocolate with a wooden spoon. It’s a mighty batter, quite thick. So use your muscles. At this point you can either refrigerate the dough for 12-24 hours (which I did with some of it), freeze the dough for about 1 hour, or bake them straight away. I found they were equally delicious either way, but naturally you will have less spread if you chill them. Also, you can chill them in the freezer for 1 hour if you like. Roll them into golf ball sized balls and space them about 2″ apart on a parchment lined or greased baking sheet. Bake 12-16 minutes. Let cool briefly and then remove to a rack to finish cooling. Eat them. All. I mean, now you can gift them to family and friends and such. Store in an airtight container, and unused dough can be frozen or kept in the fridge for up to 72 hours. ha! hardly. but thanks! i’ll take it. these look so good I will be making them asap! if you do let me know how you like them… i love recipe feedback. Mmm! Those look delicious! I’ve never thought about doing the whole salty-spicy cookies before! Definitely will try it soon! 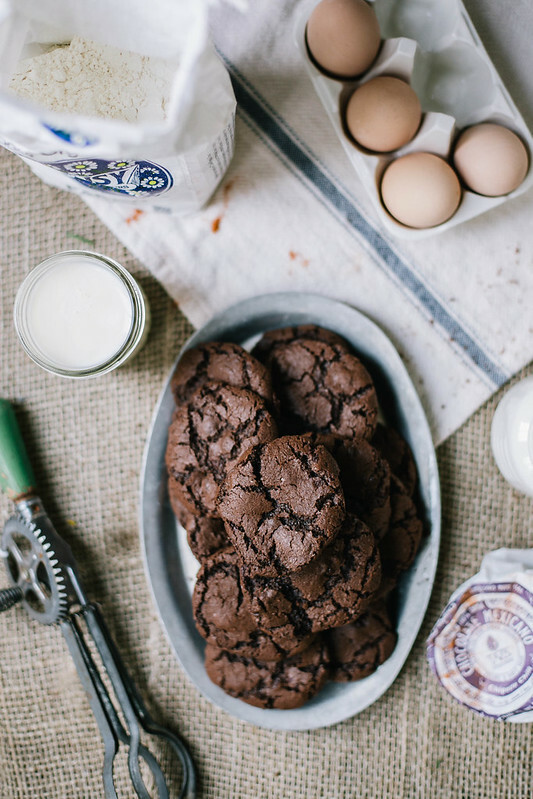 I’ve always liked my chocolate chip cookies a little salty…so these definitely do it for me. I like a little nod to savory in my baked goods… it always makes them more interesting, I think. You are definitely my kind of gal! I like the whole salty chocolate thing too. In fact, I regularly sprinkle a little salt on top of my hot chocolate before I drink it. Another I do which I think you might like is I put ancho chili powder in my hot chocolate. Just add it to your powdered mix before you add the hot milk sprinkle a little salt on top, yum! I don’t measure my ancho, just eyeball. So you know add a little, if you want more add more. I probably add a half a teaspoon or so I’m guessing. But then again, I usually put in more chocolate the directions say, so it’s all to your taste. Hope you try it and like it! And of course, these cookies look so delicious! They remind me of some double chocolate ginger cookies I had once in Canada. I’ve been wanting to recreate them but I didn’t have a recipe. I think I’ll try your version! 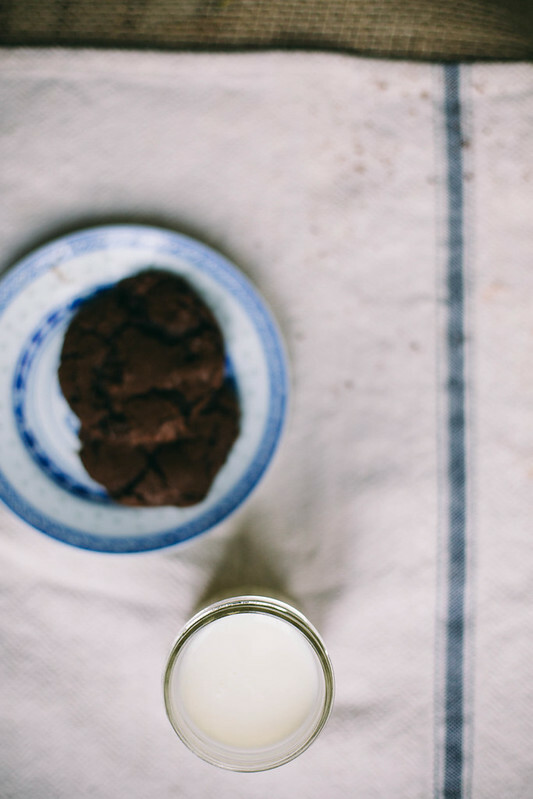 We are huge fans of chili chocolate milk/hot chocolate! When we first started dating he would always make big pints of chocolate chili goat’s milk for me before bed. I fell in love. But I never though to try a little salt… now I have to! And I like the idea of a spicy ginger cookie too.. mental note. I’ve had a dark chocolate/chili/ginger/hibiscus bar before.. so it sounds sensical. Oh my lawd. Exactly what I was craving without even knowing it. Tomorrow, I bake! They are so worth it. & so easy. Hardly more time than it would take to buy cookies and stupid better. Just dumb they’re so good. While you might hoard the actual goods, I’m so glad you’re sharing the recipe at the very least. This looks fantastic. When we went wedding cake tasting a few weeks back, one of the options was chocolate and chilli. Although we thought it might be a bit much for the guests, it was absolutely delicious and I’ve been wanting to make something chocolate chilli flavoured ever since. Bingo! a) congratulations! b) what an excellent groom cake idea… i’d have a hard time considering my guests when faced with a choice like that. These are definitely a way to get your fix. YUM! I love spicy cookies! Your photos are gorgeous! If spicy dark chocolate is unavailable do you know if you could add chili powder or something similar to dark chocolate instead? 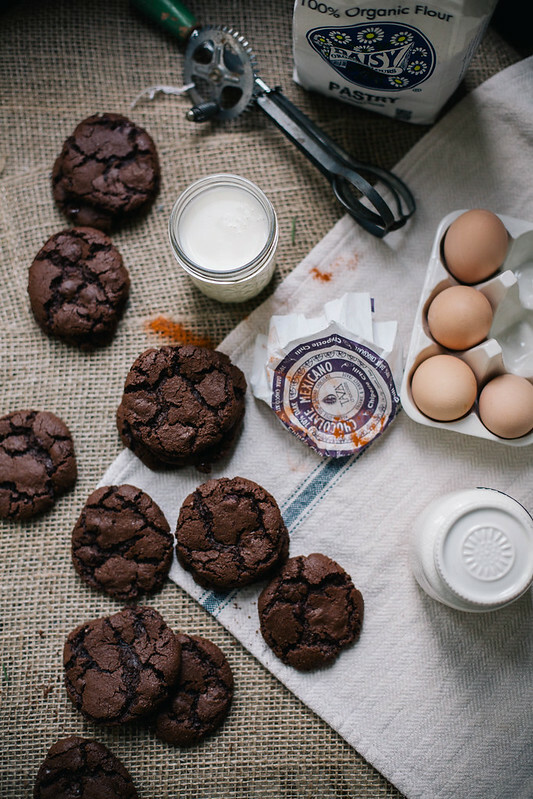 Gorgeous cookies, photography, flavors, the whole thing, mmmm, so good! Just found you and just pinned! 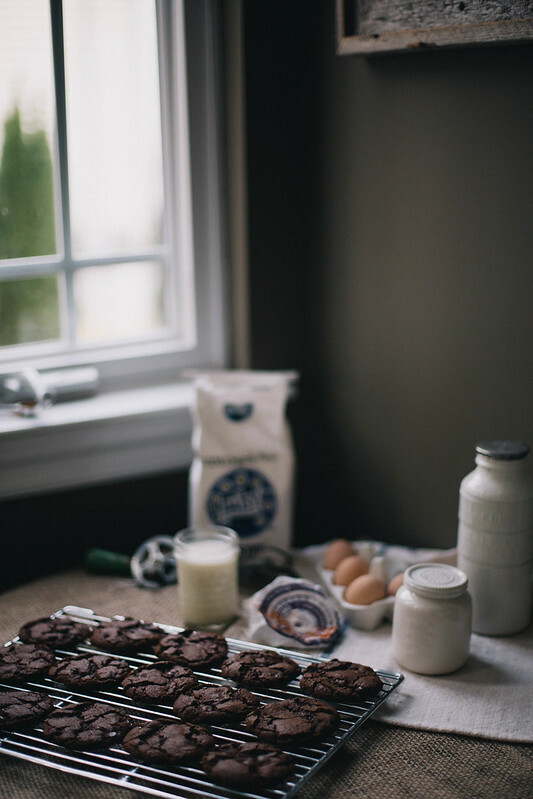 cookies are one of those things I rarely make, not sure why… I have been craving a chocolate cookie lately though – and THESE are going to be made tonight! I cannot wait. Oh mah gah, your photos!! I’m in love!! And the cookies sound amazing! I just got back from a walk with Cookie, full of motivation to de-fluff with greens and lemon water, and now I would kill for a plate of these cookies. 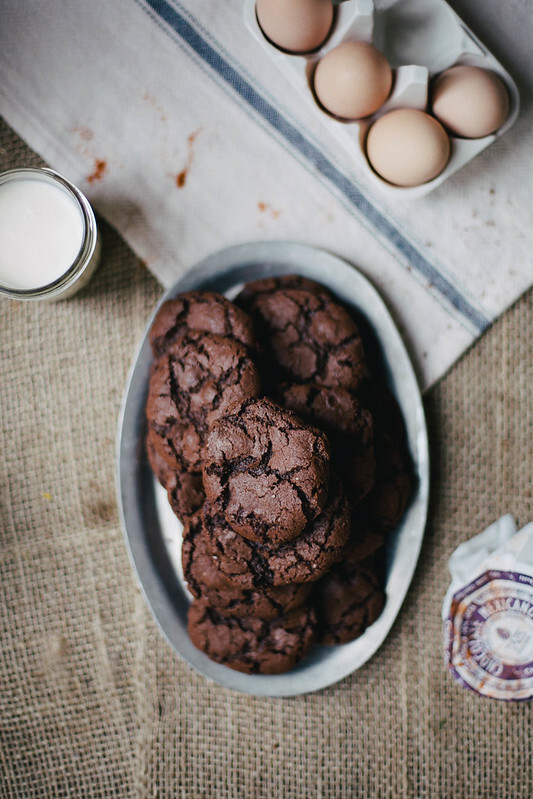 Spicy, sweet, chocolatey, salty, YES. I must do them! You have created a need! Oh yum, your cookies look so good! 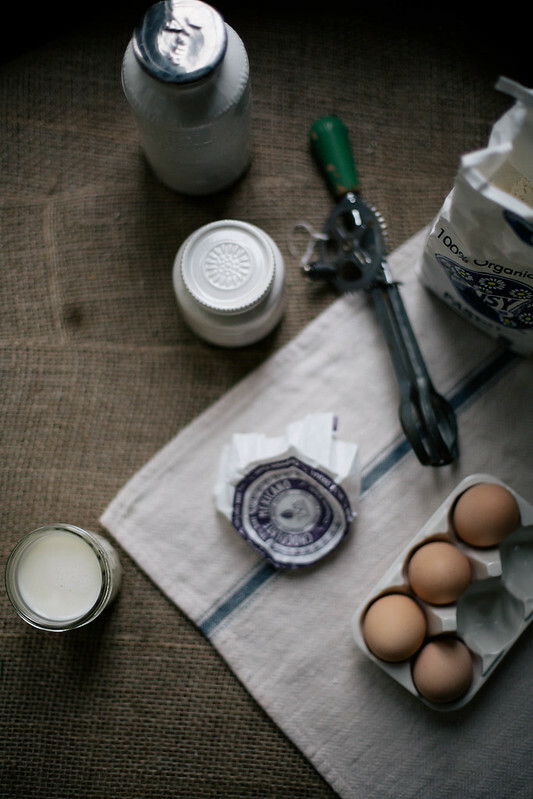 What beautiful photos – I’m so glad I stumbled across your blog! Thanks for the recipe! My husband’s love language is chipotle. These will be made soon!! That’s looking very delicious. However, I have been looking forward to prepare this cookie but I couldn’t find one ingredient which is called, “cayenne powder”. If I make cookie without this powder could it taste still better? 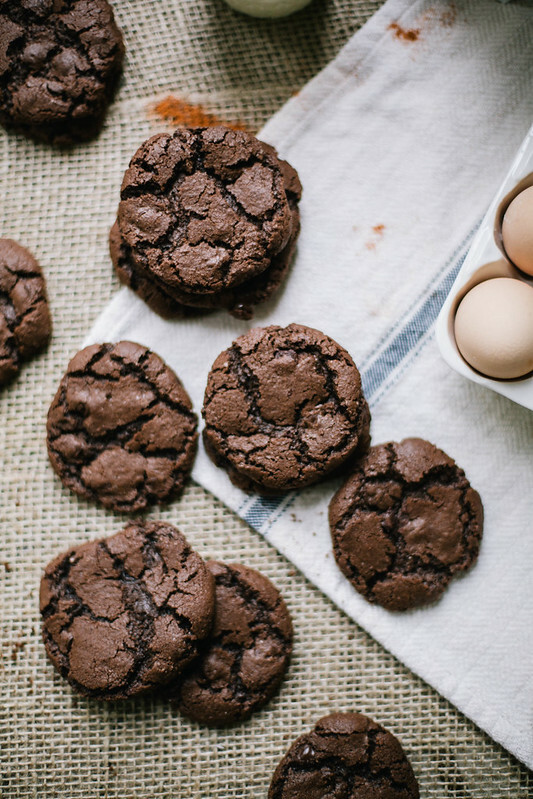 I cant wait to bake these! Any excuse for chilli chocolate! I just made these… haven’t actually baked any yet, but the dough is AMAZING. (I used egg substitute, so I can eat as much raw dough as I want.) 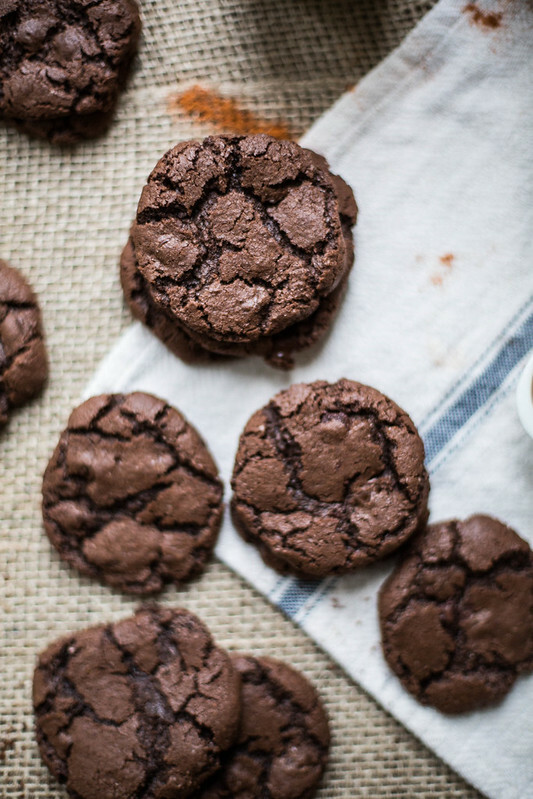 My husband and I are addicted to spicy chocolate cookies, and with the addition of just the right amount of saltiness… I’m swooning. Pretty sure these will be the new favorites. Wow, these look incredibly delicious, as one of my absolute favorite combinations in cocoa, cayenne pepper, and salt. Started to make the recipe and “Whisk the first five ingredients together in a bowl” as per your instructions only to later realize that cayenne was the 6th ingredient. Had to mix it in after I added the liquid stuff which was extremely difficult because of the thickness. Perhaps amend the instructions to say the first “six” ingredients? The typo has been corrected, thank you & I apologize! Interesting chocolate recipe, and really looks delicious, i will surely make this. I made these cookies for my teachers for treat day at school and the container got empty! They were a hit thank you for the recipe! This cookie has mixed combination of salty, spicy and sweet flavor. I think it will be a favorite cookie for all cookie lovers. Holy crap a cup a cocoa powder! And that was a good “holy crap” by the way. 😀 Pinning for sure, I am definitely intrigued. I love dark chill chocolate, these look like the next progression of my spiced chocolate journey. Lovely blog, following. They are *totally* the logical progression of a chili chocolate fetish! I am so totally in love with your blog and especially with peach and basil hand pies (made them and gave half of them away at my uni and everybody loved it as well) and those amazing cookies! They’re crunchy but not too cry and the chocolate flavour in them is very intense, just the way I like it! In fact, I made two versions of them: the classic chocolate chili you gave the recipe for one and the chocolate-drizzled-with-spicy-caramel-one. (just didn’t put the chili in the dough and mixed it with the cream I poured it the caramel). For the caramel I used the recipe you gave when you talked about those Earl Gray marshmallows. It was just, well, an inspiration strike. I think that’s one of the best compliments I’ve ever gotten on this blog. The biggest reason I do this is to hopefully motivate people to try things themselves, to cook & do. I am so, so happy to hear you’ve been baking & cooking my recipes…and that they were good! Thanks so much for all your kind words, I appreciate it immensely. And your English is great! Baked a half batch of these tonight while waiting for your pumpkin cake to cool. Spicy! I just made these and they were amazing. I will absolutely be making these again! I didn’t have Tazo chocolate–but I had just made a batch of chipotle black bean soup and had leftover chipotles in adobo. So I added a teaspoon of chipotle-adobo sauce along with the vanilla. It gave a rich smoky hot chipotle flavor that balanced well with the cayenne. Just found your blog through this recipe. Will be continuing to follow, amazing looking photos and superb writing! Great job! I’ve made these 3 times now. I can’t stop! I’ve made a few adjustments based on my tastes. I add slightly less salt to the dry mix. Then, just before baking, I dip each golf ball sized cookie into a bit of Hawaiian red sea salt. I love tasting the salt first, and then the dark chocolate bittersweetness that melts into warm spice. The contrast between the rosy salt crystals and the cookies’ deep brown color is beautiful too. Other than those changes, I follow your instructions exactly. I doubled the recipe for Christmastime, and they still come out flawless. These cookies are perfection! Everyone loves them. Thank you! I made these today and they are amazing! Love the kick of the cayenne pepper and the bite of salt with the chocolate. Will be making these again. Made them recently, and loved the results – and have been meaning to write here and share the adjustments I made. They mostly had to do with measurements, since things like flour and cocoa are always tricky to measure in volume (changes depending on density, which can be influenced by a lot of things) and I tend to prefer weight. Looked at some sources online for conversions, but eventually when I made the dough (using the volume measurements, but weighing as I go and adjusting to what felt right) it ended up being slightly different than any of the conversion results I found. Everything else remained mostly the same, down to the quality butter (which I usually don’t bother with, but figured I’ll try this time). Since we don’t have those Tazo chocolates here I used Lindt dark chocolate with chilli instead, and replaced some of the chilli powder with smoked paprika – and I added some cinnamon, which I’ve seen in the comments and thought was a good idea, although I’m not sure the flavour was very prominent in the finished cookies. Actually bought Maldon salt to use in these (not regretting that buy, it’s so pretty!) and sprinkled a little on top on the cookies before baking… well, half of the cookies, because I forgot to do it in my first batch. It’s a very nice addition. The other big(ish) change I made was to go the slice&bake method, rolling the dough in clingwrap into four long ‘sausages’, two of which I sliced and baked (they turned out smaller than the golf-ball size you have in the instructions, which sounded kinda huge to me, so that impacted baking time, and probably texture as well), the other two froze for a later time. I think the later time will be fairly soon… they are so tasty! A wonderful balance of flavours. Thanks for the recipe! I just made your cookies and they are WONDERFUL!!!! I couldn’t find the Tazo chipolte discs so I used Lindt chili chocolate and added 1 tsp of crushed chipolte peppers and they were perfect! How can I follow your blog? I just recently found your site (I scoured through it all in one night! ), and while I’m vegan, I find much inspiration in your recipes. I made these over the weekend after a stressful week of college, and they hit just the right spot. Cooking really is cathartic. None of my friends are vegan, or even have the same foodie concerns as me, but everyone loved these, even after I told them that little extra something was chili powder (I had no cayenne on hand). They were surprised, but pleasantly. I made a spicy batch and a non spicy batch. Added cinnamon to both. When hot out of the oven I sprinkled a little colored sugar into the cracks. Red vs blue. Forgot to say I didn’t have the tazo hence the added cinnamon. oh.m.g … i just made these and they are spectacular! i didnt have chilli chocolate on hand but i put enough in you still get a little heat. the saltiness also comes threw perfectly! Perfect man cookie if your man like chocolate to! ps LOVE your blog, i plan on trying almost everything! Hi!! These sound delicious! 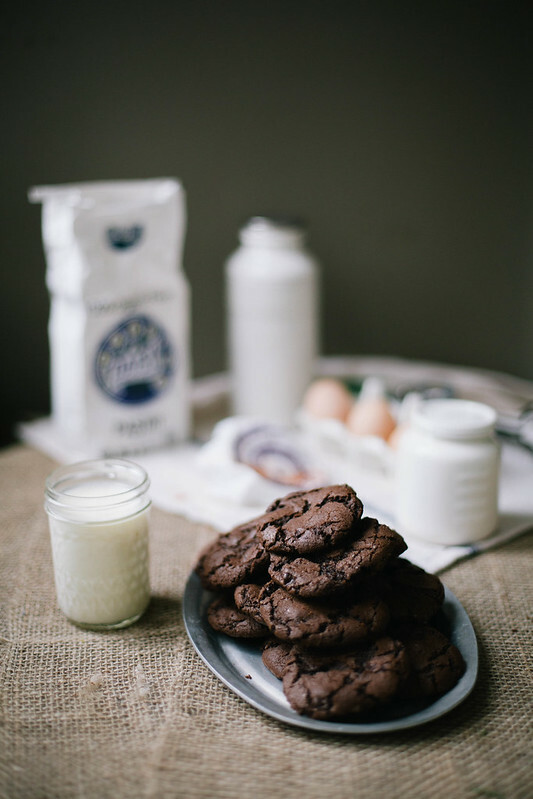 Could I use all purpose flour instead of pastry flour and use milk chocolate instead of dark chocolate chips? how would that taste you think? When you state brown sugar in your recipes, do you mean light brown sugar or dark brown sugar? Kindly advise. Thanks. Been making these for 3 years now, with slight modifications (namely adobo chilis). Posted it on my blog. Thanks for the inspiration; they are one of my favorites!! 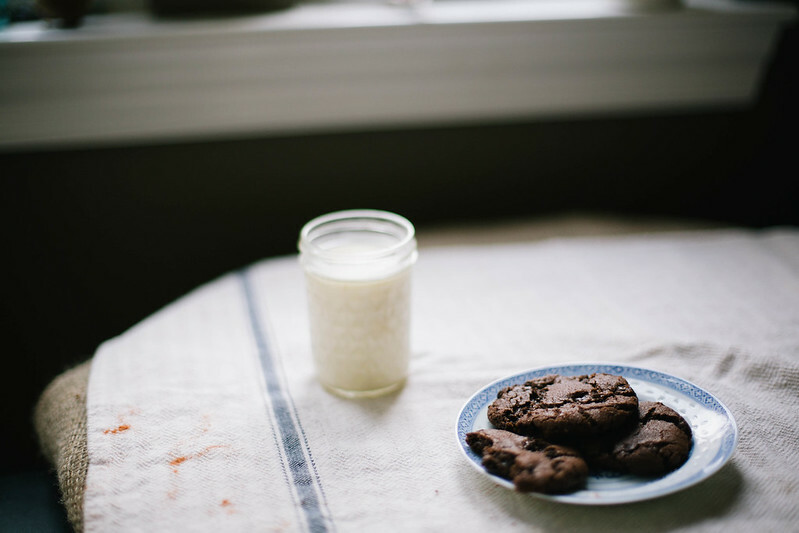 Love the cookies, and your photos are exquisite. I added pecans and cinnamon to the mix, and light dusting of powdered sugar. Giving them away as Christmas gift! Thanks for such a great recipe!! I just made these and had a bite while they where still warm. Ooooooohhhhh man these are good. I chose to use a generous 1/2 tsp of Cheyenne and about 1/8 tsp smoky chipotle powder for 1/2 the recipe. and in lack of dark chocolate I used chopped up milk chocolate and a bit of dark. My 2,5 year old son really wanted one. But nope, these one are adults only. A nice heat in the back of the throat. I have been craving these cookies for ages, as the coffee shop by my office stopped making a similar version. I’ve googled recipes, but none of them seemed good enough to try. 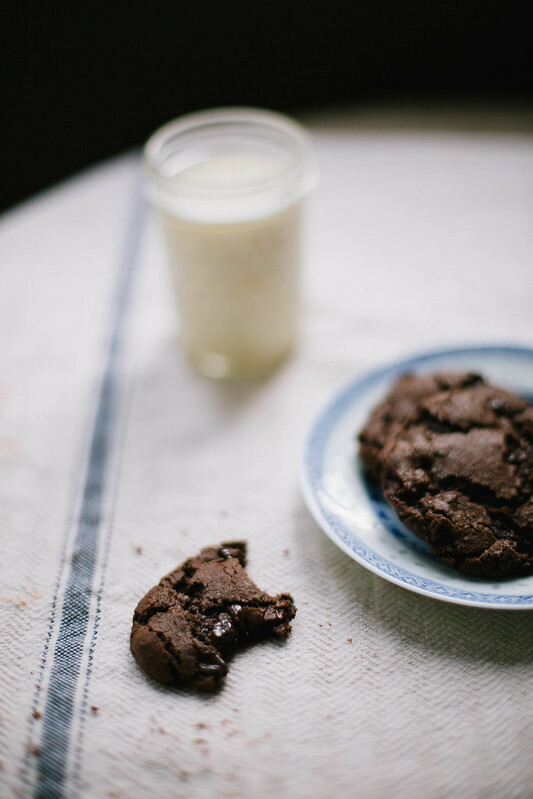 I stumbled upon this recipe yesterday, and thought I’d finally try to get my spicy chocolate cookie craving satisfied. This recipe is perfection! 🌶 🍫🔥 (and ten times better than the cookies from the coffee shop). Thank you for posting, will def bake these again!